We all want the fish in our aquariums to stay healthy. Unfortunately, like humans, fish may become ill from time to time. You can dramatically reduce the likelihood of a disease entering your aquarium by purchasing livestock from a reputable source and quarantining all new arrivals before placing them into your display tank. That way, you do not risk exposing healthy fish to a disease or parasite that your new addition is carrying. Sometimes, despite our best efforts, illness can set in no matter how many precautionary measures we have taken. That is why we are going to share some of the most common and effective fish medications so you will be ready to treat your fish the instant you observe signs of illness. Medications that must be used in a hospital/quarantine tank are generally going to be the most potent and therefore most effective. Since you are treating the fish in a separate aquarium, you are able to use a stronger medication without worrying about it adversely effecting delicate corals and invertebrates. Seachem Cupramine, for example, is well-known for its ability to treat ich, velvet and external parasites. 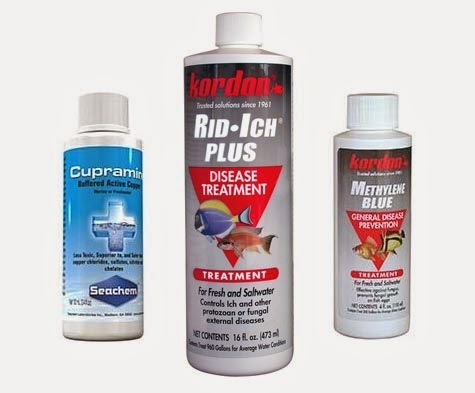 Kordon Methylene Blue is often used to treat fungal infections, but it can also treat ich and other parasites. Your hospitalized fish should be treated and quarantined for 2-4 months before returning to your display tank. A quarantine tank doesn’t need to be fancy. In fact, it should be kept as simple as possible for easy setup and maintenance. All you need is an aquarium, heater, filter and somewhere for the fish to hide. Large diameter PVC can make a great hideout for fish and is affordable and easy to find. With minimal biological filtration, you must keep a close eye on the waste parameters in your quarantine tank. Seachem Ammonia Alert is a helpful and inexpensive way to see if ammonia is present in your hospital tank. We recommend setting up a quarantine tank to medicate sick fish in almost every circumstance. Of course, we realize setting up a separate aquarium may not be feasible for everyone. It is also possible that all of your fish may have fallen victim to a disease or parasite. In these instances, using an in-tank, reef safe medication may be the best approach. Reef safe medications are often less potent and therefore less effective than medicines that require treatment in a quarantine tank. This means you may need to administer the treatment multiple times before your fish makes a full recovery. Ruby Reef offers some of the most popular in-tank treatments. 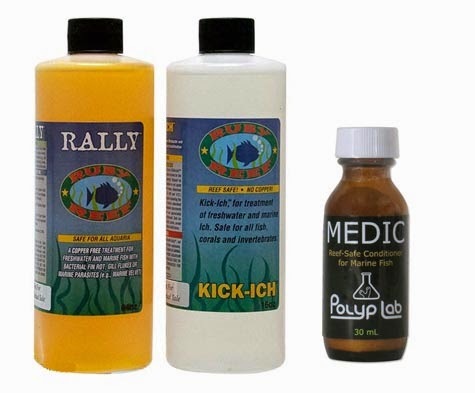 Ruby Reef Kick-Ich targets the pesky ich parasite; Ruby Reef Rally is a copper-free treatment for harmful bacteria, fin rot, gill flukes, velvet and marine parasites. Polyp Lab Medic is another reef safe medication that treats external parasites like ich and velvet. If the disease is caught in its early stages, reef safe medications can be quite effective. If the infection is severe, you may need to repeat the treatment (if it is safe to do so) or bite the bullet and set up a hospital tank so you can treat the fish with a more potent medication. The last group of medications we’ll discuss are also the kind our staff solemnly swears by: medications that are added to fish food. Although often overlooked by hobbyists, these types of medications offer a lot of great benefits. Rather than treating the water around your fish, mixing medicine with food is a surefire way to ensure that the medication is successfully delivered. If you are adding a new fish to your aquarium—or whenever your fish appear stressed—feeding a medicine-infused food can halt the spread of illness before it starts. You can even combine medications as a sort of “dual attack” on diseases and parasites when feeding. 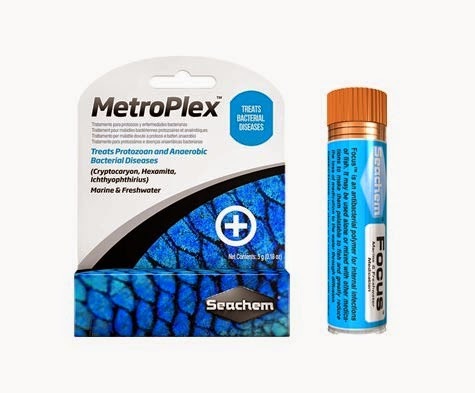 Seachem Metroplex and Seachem Focus are two products that work together to combat a variety of infections and parasites. Just add the proper amount of powdered medication(s) to your frozen fish food and allow it to soak for 15-30 minutes before feeding. It is crucial to read and follow the medicine manufacturer’s instructions exactly as prescribed. Do not overdose medications. You must also allow sufficient time for the medicine to take effect, so patience is key. Aquarium medications that are added to tank water can be adsorbed by activated carbon filter media and possibly removed by your protein skimmer, so be mindful of this when treating your tank. If you have questions about aquarium medications or need help identifying which illness may be plaguing your tank, please contact our aquarium experts for free and friendly advice. We’ll be happy to help you choose the right medication and can even deliver it using overnight service for a nominal fee. 4See all of the aquarium medications available at Marine Depot.